GSP is in town this week and Ovince St-Preux is coming back next week. 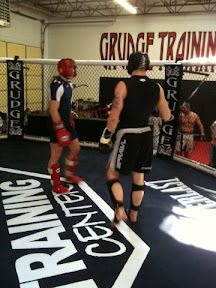 Ed Herman just started training here after he moved to Ft. Collins, CO. All the guys are on top of their game ready to fight: Brendan Schaub, Eliot Marshall, Duane Ludwig and even Shane Carwin. I'm gonna smash Akiyama!! Check out what came in the mail today! I made #2 on all time UFC record! Last circuit before my fight!